Congratulations to Tiffany S. from Athens, Alabama! You've won the Microsoft Windows 7 giveaway! Here's Your Chance to Upgrade to Windows 7 for Free! Window 7 offers significant enhancements over Vista and XP, and we believe it's worth the upgrade. See our article, Should You Upgrade to Windows 7? for an overview. Now, you have the opportunity to upgrade for free! 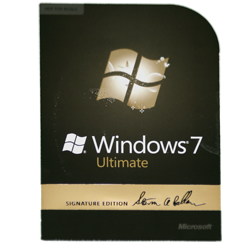 One lucky entrant will win a copy of Windows 7 Ultimate "Signature Edition" ($319.99 MSRP)! This is the top-of-the-line version of Windows 7 and will allow you to upgrade from a previous version of Vista or do a custom install from either Vista or XP. Both 32-bit and 64-bit versions of Windows 7 are available on the disk. To enter the giveaway, simply subscribe to our newsletter during the contest period using the "subscribe" box on this page or any other page on the site. All subscribers to the newsletter are eligible for the drawing. Want more chances to win? Forward our newsletter to a friend. If they subscribe and enter your email address in the "Referred by" field when registering, you will get another entry. Note: the "Referred by" email address must be the same as the original subscriber's email address in order to get credit for the referral. The giveaway will end at 11:59pm on November 10, 2009. Comments are welcome, but will not count as an entry. To be eligible, you must be a newsletter subscriber or use an alternative entry method as described in the Official Rules. I WOULD LIKE TO UPDATE MY SYSTEM. I would love to upgrade my system!!! I could really use this I sent my laptop back to be fixed,and they took Windows off my computer. I cannot find the discs to reload it to my computer. This would be great to win. Thanks for the contest. I am already a subscriber. Am I entered? Yes, if you are already a subscriber, you will be entered in the contest. I really need an upgrade. Thanks for the chance. Ugh, our computer died a week before the ones with Windows 7 came out so we are stuck with a new computer with Vista-not pretty and not fun. We’ve never had this many problems. We would love to win this and get rid of Vista! Windows 7 rocks and hopefully Mac’s will work with it also. If windows 7 is not great going to Mac! I subscribed. I could use this upgrade! I would like to have the new windows. This defiantly one product that I must either buy or win. I have been battling MS service pack 3 update problems for 1 month. Thank God I have friends that understand something about a computer especially after making over 10 calls to the different tech’s as Microsoft, SONY and finding out there will be NO Patch file for this mishap. My computer and I need this.From everything that I have read, it is GREAT. I want to upgrade from Vista. I would love to have this upgrade. Thanks for the contest! I need to move forward in my life! Thanks for the Windows 7 Ultimate “Signature Edition” giveaway offer. Hope to try this upgrade. i need that 4 my computer!!! I could really use this! Thanks! I think this is going to be the best Windows ever! I hope that I have a chance on winning something like this cause, it seems that I enter stuff but never win anything. And this would be a nice to start for winning something like this. This is just what I need, a very cool prize. Hope I win! I’d love to opportunity to upgrade my current software. It would give the opportunity to get back with my friends that were able to upgrade last time when I was not able to. We stopped communicating due to my not being able to read their emails. Thank You for the chance! Cool prize!! I’d love to update to Windows 7 !!!! I would love to upgrade to Windows 7.
i got the newsletter…looking forward to new gadgets! It would be nice to finally upgrade. Thanks for the chance! I will run this on my Mac with VMWare!